During case solving, we worked hard and insistently, otherwise, we spent our leisure time in Disney World, next to a swimming pool, in an indoor shooting range and with networking. This is how I could shortly summarize the unforgettable week I spent with my teammates from Corvinus University, Natália Madarász, Luca Csanády and Domonkos Erőss, and our supervisor, Miklós Kozma at the Heavener International Case Competition 2017 in Gainesville, Florida. 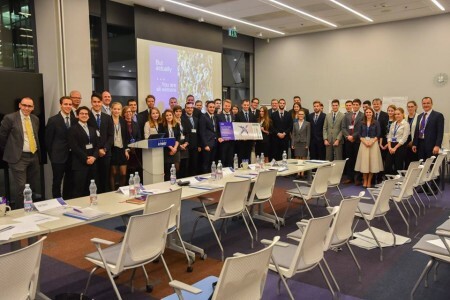 From previous competition experiences and others’ stories we knew that a case competition is not solely about tough work. Nonetheless, before the competition probably none of us expected to return with the most outstanding achievement of our professional career and a bunch of amazing experiences – we only wished we would. At HICC we competed against 18 teams representing leading business schools from around the world. The teams were divided into 4 randomly selected divisions, and only the division winners were to make it to the finals. Our task was to solve a 6-hour and a 30-hour case study, and present our proposals to a professional jury composed of corporate executives and management consultants. For the 6-hour case, we were asked to improve the existing HR strategy of Northrop Grumman Corporation, a leading US defense contractor, while during the 30-hour case we were advising CSX Corporation, a leading US rail freighter on how to best improve their strategy with a $500 million investment. From a professional point of view, not just the victory, the best presenter award, and the many praises will remain nice memories. 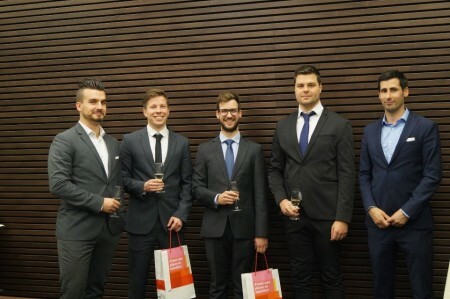 Presenting solutions to C-level executives of two Fortune 500 companies who regarded us as colleagues, took seriously what we said and provided insightful feedback was at least as unbelievable an experience for us, 4 undergrad business students from Hungary. The professional activities were supplemented with American-styled leisure activities: we attended an indoor shooting session, networked in a swimming pool (following a BBQ and the Super Bowl), and spent a whole day at Disney World in Orlando. The organizers undoubtedly went the extra mile for us! And, by the way, when reserving our flight tickets, our University was flexible enough to provide us an extra free week in America following the competition. Therefore, half of our team let off steam in Los Angeles and the other half in Mexico – further enriching the incredible adventure. In my opinion, 3 factors jointly played a key role in our success at HICC: thorough preparation, past experiences and persistent teamwork. Case Solvers have unimpeachable merits in our successful preparation, and on behalf of my teammates I would like to thank them the tireless work they have put into the consolidation of the Hungarian case culture in the last five years. With 10+ case solving trainings, courses and camps behind our backs, our team members were given a rare chance to accomplish something extraordinary. The victory would have not been possible without Case Solvers. Similarly, we are very thankful to the teachers of the Institute of Business Economics at Corvinus University for the effort and trust the put in us. Thank you!